Replica of Harry Styles from One Direction!! This is the larger version and measures 9mm wide on the top. The smaller version measure 7.75mm. The style number for the smaller one is RF078. 3 Stone inlay turquoise Men’s or Ladies ring. 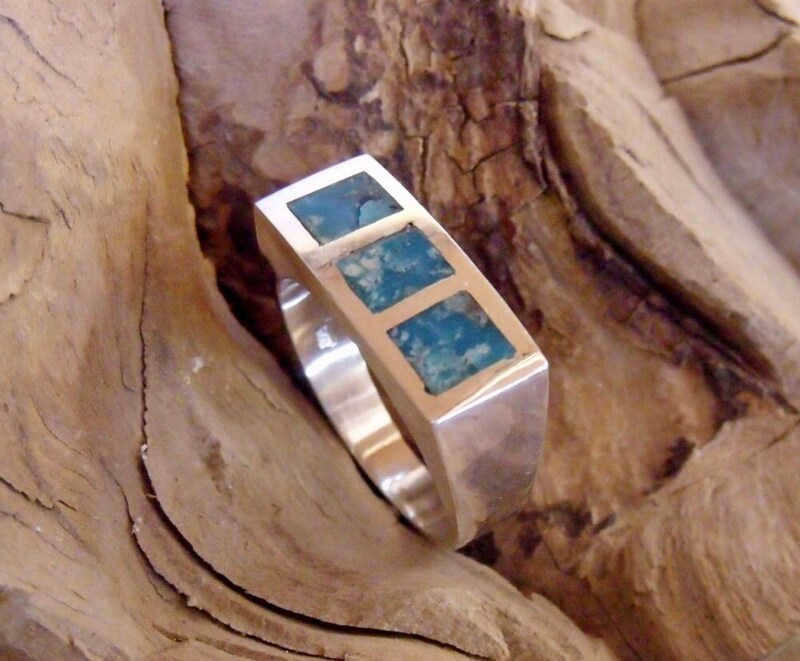 Remember that Turquoise is a natural stone that come in many colors. I do my best to match the color of the stones in the ring. If you like lighter or darker turquoise or clear or with matrix please let me know and I will do my best to get that color. This an old style traditional ring popular in Native American art. I can put many other stone in the ring and also can make it out of gold. We will make it in your size. All others will come with stones that are close in color but no two stones are the same. Photo 5 shows the larger in the center and smaller on each side with different colored turquoise.